HipFits are the absolute must-have to clip on to backpacks, gym bags and more! It’s the hip clip-on accessory that gives girls the chance to get in on the hot trend of personalizing accessories that’s making headlines on the pages of People StyleWatch, Vogue and more. Great ornament for the tree, too! In honor of Breast Cancer Awareness Month HipFits is working with the Breast Cancer Research Foundation’s “Shop Pink" initiative. 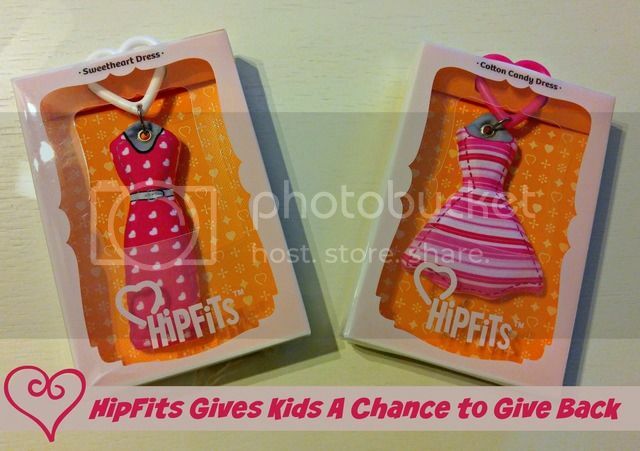 To honor the Breast Cancer Research Foundation (BCRF) and to help teach children about the importance of giving back, HipFits has designed a special BCRF pink dress collection which includes the Taffy, Cotton Candy and Sweetheart Dress. HipFits is donating $3 to the BCRF for every one of these styles purchased throughout the year. And throughout the month of October, the company is also donating $1 from the sale of any one of the HipFits in the entire 21 piece collection. HipFits are this year’s must-have for kids fashion fun! They’re the new clip-on accessory that gives girls the chance to get in on the hottest trend in accessorizing - charms and trinkets to personalize your purse. Not only will your daughter be stylish, but also help support the Breast Cancer Research Foundation. It is a great way to teach your daughters the importance of breast exams and support a wonderful cause! These soft, fabric-covered, gel pad-filled, four-inch dress-shaped charms are tethered to colorful heart-shaped clips for easy attachment to backpacks, purses, strollers and more. Featuring more than 20 popular looks to reflect each individual’s own fashion identity, each tastefully designed dress comes with a short poem that gives a personality to each HipFit that will instantly connect to any young girl’s heart. Girls can collect their favorite fashions and show them off to match their moods. They easily attach to their backpack, purses, etc. They are reasonably priced, so your daughter won't break the bank and collect as many as her allowance allows. She can switch them out to match her favorite outfit or theme. These are so cute and loved by my tween! Pick some up today for the Christmas stockings and help give back to the Breast Cancer Research Foundation.